After a working life as an academic, I wanted to make things, so I took to embroidery and various other crafts, which I have enjoyed working at for many years. Because he’s worth it. 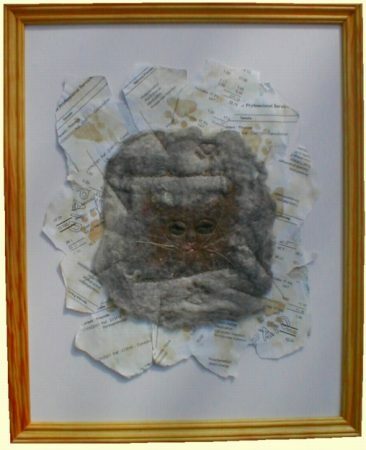 Cat face on a background of torn-up vet’s bills. Torn-up vet’s bills for background, a cat face made from felted cat combings, plus some real whiskers – collected after falling out naturally. I have used various materials over the years. I found cat combings extremely useful for making felt, but unfortunately I no longer have the cat.